I’ve just finished the intro video for my Course Clarity Kit. I used Screenflow 8 and tried to keep it short. (See below). As a learner, I am always eager to get straight to the content. I plan to add a similar length video to introduce each worksheet in the course, there are 4 multi-page pdf’s. 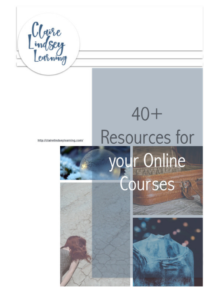 The idea of the course is to help new course creators overcome the overwhelm they feel with having an idea rolling around their head. The course clarity comes from having a plan and the tools to carry out that plan. and a good idea of how to continue their development process. I tried to keep the background slowly moving through navigating to the course. Then as I mention each part I have a screenshot of that worksheet as the focus. Can you tell I’m trying to keep the focus off of me talking and on the content in the course. Exporting and moving videos around can take time due to how large they are. After creating the video in screenflow it has to be exported and then it has to be added to your learning management system (I use Thinkific, you can see my tech stack for course creation here.). One feature of screenflow 8 is that it has the option to export the video straight to Youtube. It can also export directly to Google Drive, which is advantageous in two ways. Exporting to Google Drive saves hard drive space and it also saves time. There are different options available for adding videos to Thinkific. To upload from your hard drive takes another 5 minutes or so depending on size. There is an option to add the video to Thinkific video library via Google Drive. For some reason that I cannot explain, adding a video via Google Drive is almost instantaneous. Even though 5 minutes doesn’t sound like a long time for one video, it adds up during the production of a course. Let me know what you think and if you would like to read more posts or videos about course production tips. It’s always good to gain clarity over a smooth process.